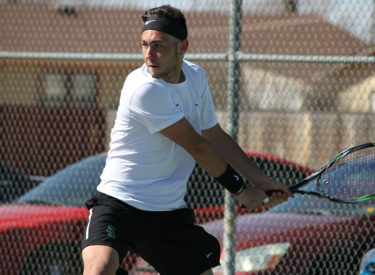 PLANO, Texas – The Saints tennis team kept rolling on day of the NJCAA National Tournament, advancing to the semifinals in eight of the nine flights. The one loss set them back one point in the leaderboard, now sitting in third place as a team. Nick Rousset started the semifinal run with a come from behind victory in the quarterfinals over Christopher Bulus of New Mexico Military. After dropping the first set 6-4, Rouset battled to win the second set 7-6 (6) before taking the third set and the match 6-4. He will take on Tin Chen of ASA Miami in the semifinals. Duro Opacic joined Rousset in the semifinals, losing just one game against Gergo Rendek of Mesa, winning 6-0, 6-1. Opacic will face Manuel Pilotto of Laredo for a chance to play for a championship. Hugo Lobo kept the run going with another run-away victory, defeating Iowa Central’s Colten Way 6-0, 6-1. Lobo will face ASA Miami’s Martin Mendoza in the semifinals on Thursday. In the No. 4 singles draw, Tim Lamare took a 6-1, 6-2 victory over Eastern Florida State’s Alwyn Mushonga to advance to the semifinals, where he will take on Andres Cabezas of ASA Miami. Franck Soulerot made it six-for-six for the Saints, becoming the final singles draw to make it to the semifinals defeating Eastern Florida State’s Fabricio Galvan 6-3, 6-4 to advance in the No. 6 singles draw. He will face Karl Mosterdof Tyler in the semifinals. Hugo Lobo and Nick Rousset won a tough match in No. 1 Doubles to advance to the semifinals, beating Manuel Pilotto and Juan Cruz Scoppetta of Laredo. After winning the first set 6-2, Pilotto and Scoppetta fought back to win set two 7-5, but Lobo and Rousset kept their eyes on the prize to win the final set 7-5. They will face Alex Parker and Marcus Walters of Tyler in the semifinals. In No. 2 doubles, Lamare and Opacic seasons ended at the hands of Andres Cabezas and Kentaro Mizushima of ASA Miami, beating the Saints tandem 6-3, 6-4. The team finishes 5th at the National Tournament. Benji Finet and Carlo Izurieta punched their ticket to the semifinals of the No. 3 Doubles draw with a 7-6(5), 6-4 win over Zach Frisbie and Thompson Tong of Collin. They will take on Killian Dagneaux and Casey Edwards of Jayhawk foe Cowley in the semifinals. The Saints dropped to third place in day three with 35 total points but sit just one point behind Tyler and ASA Miami for first place. Seward can make up ground during the semifinals as four of their opponents are from ASA Miami.